I have been getting frustrated lately with the amount of Lego that has been spread ALL OVER the house. I love that the kids play with it and build all sorts of creations, but I don't like the mess when it's spread in several rooms! So I have been scoring the net and Pinterest for Lego storage ideas and these two were the ones that seemed to be the most popular and workable for me (oh sorry, I meant the kids! haha). The first one is from iHeart Orgnaizing blog on this post. I think this lady used the above post for inspiration and created this Lego station. You can see her blog post here. Both have different ideas for storing the manuals. At the moment ours are just loose in a bin, but that may change, we'll see how it goes. I also love this idea I found on flickr. But 1, we didn't have that much room, and 2 we don't have that much Lego (yet!) heheee But isn't it awesome! Lego builders dream! I tidied up the "train" room and we put down a mat, took off the shelf from the coffee table (so the kids can sit at the table without hurting their shins) and set it up in there so they have a creating station for either Lego or trains. Definitely a great idea. 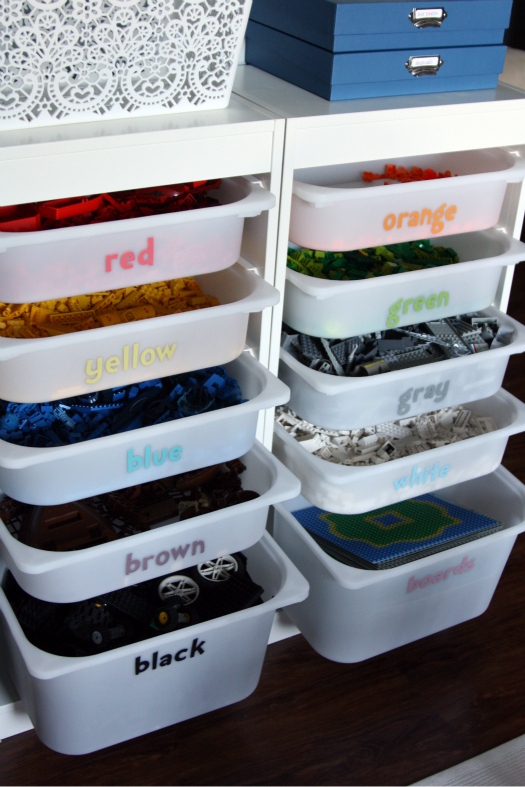 I have pinned a few Lego storage ideas too, and one where the manuals were all organised in a ring binder. Not sure when I'll ever find the spare time to do that though!! And to be honest, I know Tyler would never keep the Lego in the right coloured boxes. He has a table to create on and it's always spread all over it! He seems happy enough having it all in a couple of big plastic bins, and can usually find what he needs by "digging for gold". One day we might have to change the plan if our playroom gets turned into a rumpus room. His bedroom is small and we'd have to go with the under bed storage idea.